To have a Safari party, you must get a little wild with the tableware. The Medium Zebra Plates are perfect for the little ones to handle. 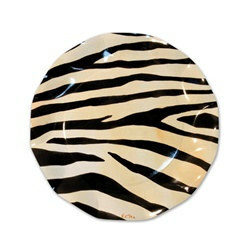 The Medium Zebra Plates come in a package of (10) scalloped paper plates with a fun Zebra print. The print on the Medium Zebra Plates are a splotchy tan background with a black zebra print. Be sure to pick up a pack of the Zebra cups to make it a matching set.